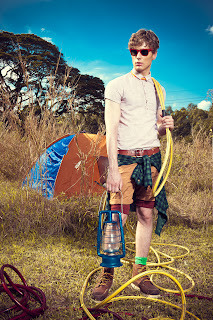 Hang Ten Spring-Summer 2012 - The Great Outdoors - Hello! Welcome to my blog! So, how's your fashion this summer? This season, Hang Ten re-launches with its newest collection, which takes us back to the brand’s trendy, adventurous, and forward California heritage roots. Inspired by the carefree escapades in the great outdoors, Hang Ten spring-summer 2012 takes us on a stylish adventure with the brand’s staple and up-to-date fashion that brings outdoor style front and center. Hang Ten was established as a casual clothing label that imbibed the relaxed style sense of the California culture. Initially a swimwear label for thrill-seeking surfers, Hang Ten’s popularity among the young and hip market tipped over to trendier collections beyond just board shorts and bikinis. Hang Ten rose to fame in the 90’s and early 2000’s, having as much as 50 stores nationwide. May it be on a trekking trail or a camping weekend, Hang Ten’s newest collection has everything to equip stylish scouts with all the spring-summer ’12 essentials. Welcome to the great outdoors! Bringing back the brand’s true soul of the surfing culture, Hang Ten’s heritage line takes hip and stylish swimwear back to the limelight. Board shorts for men and women is what Hang Ten has been originally known for. The style and function of the board short has for years been mastered and perfected by the brand, and this season, Hang Ten re-introduces swimwear to the Philippine repertoire. With various cuts, colors, and designs, Hang Ten style will make its return on the beach, ready to take on the biggest waves! Inspired by the laid-back and casual culture of summer camping, Hang Ten presents its newest line with soft tailoring, khakis, plaid and earthy colors. Evoking a sense of the adventurous outdoors, this line will bring the wild wilderness to mind. The fabric selection is strategic to keeping comfort while maintaining style. Hangten presents its newest venture to bring trend back in the forefront with flannel shirts, plaid button-downs and slim-cut trousers. The woodcutters’ style makes an appearance in Hang Ten’s spring-summer 2012 collection. Finer tailoring, slimmer silhouettes and more modern cuts imbibe the more industrial aesthetic. Parkas and hooded jackets push Hang Ten’s style forward with bolder, rugged yet contemporary designs. In keeping with the brand’s philosophy of giving customers the best value for money and the highest quality of their merchandise, their newest collection went through rigorous product development. Expect newer fabrics in 100% combed cotton and newer cuts and silhouettes that have been sewn to stylish creations.